Posted on May 19, 2015 at 1:15 pm. For the next four weeks, Guts Casino is giving away $35,000 to their players to celebrate their two year anniversary. Guts online casino was launched in May 2013, and to celebrate their successful two years of operation, the site is giving players the chance to win cash prizes and other rewards from Monday, May 18 until Monday, June 15 (Tuesday, June 16 for Aussies as explained below). The first part of the promotion sees a weekly deposit lottery every Monday, for the first three weeks, drawn and 170 lucky players will each receive cash prizes with a total of $5,000 up for grabs. Thousands of other players in the draw, who don’t win the cash, will receive Guts t-shirts, hoodies, and free spins tool – these do not have wager requirements attached. To enter, all players need to do is deposit at least $20 every week for the next four weeks to receive a ticket entry. The more you deposit, in $20 lots, the more tickets you will receive into the weekly prize draws. First week, Monday, May 18 to Sunday, May 24, will see 50 depositors score $100. Second week, Monday, May 25 to Sunday, May 31, will see 50 depositors win $150. Third week, Monday, June 1 to Sunday, June 7, will see 35 depositors win $200. Fourth week, Monday, June 8 to Sunday, June 14, will see 35 depositors win $300. It’s important to note the depositing period runs on Central European Time, so if you deposit after 23:59 CET at the week ending Sunday, your deposit will count for the next weeks lottery. Additionally, Aussies, and anyone else operating on a different timezone to Central European Time which Guts Internet casino operates on, will see a different weekly time period. For example, Aussies running on Australian Eastern Standard Time will see the weekly depositing period run from Tuesday 9:00AM AEST to Monday, 8:59 AM AEST instead of Monday to Sunday. Be sure to look up the time differences to ensure you are depositing in the right week and at the right time. The second part of the promotion takes place at the end of the four weeks, to celebrate the conclusion of the anniversary celebrations. All players who participated in the weekly deposit lotteries are eligible for the Grand Prize Draw on Sunday, June 14 (Monday, June 15 for Aussies). Here, one very lucky Guts player will be granted $5,000 in real money. All players who have deposited at least once over the four weeks will gain entry to the Grand Prize Draw, with the more tickets gained in the weekly deposit lottery giving players a better chance of winning, and the winner will be announced on Monday, May 16 (Tuesday, June 16 for Aussie players). 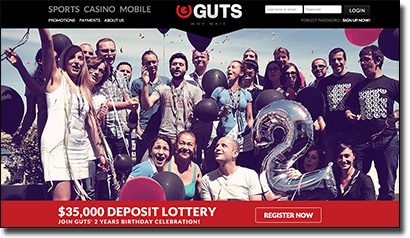 CEO of Guts online casino, Robin Reed, said their two year success is predominantly due to their loyal players. “We’ve enjoyed an amazing two years and it wouldn’t have been possible if it wasn’t for all our customers,” he said. To help celebrate their two year anniversary, the team at Guts have invited Monica, their first ever millionaire who hit the jackpot of €2,633,052 on Arabian nights in April. Monica will be flown to the headquarters of Guts in Malta and Mr Reed said this will make her win that little bit more special. “We love to celebrate winners at Guts,” Mr Reed said. “This is the largest win we have ever had the pleasure of celebrating. Mr Reed also mentioned that there are some exciting changes coming to Guts Internet casino. “We are always looking for ways to keep our players happy and have some very exciting plans for the next few months, including a move to our new gaming platform, www.iGamingCloud.com, which will greatly enhance the game performance and overall user experience at Guts.com,” he said.